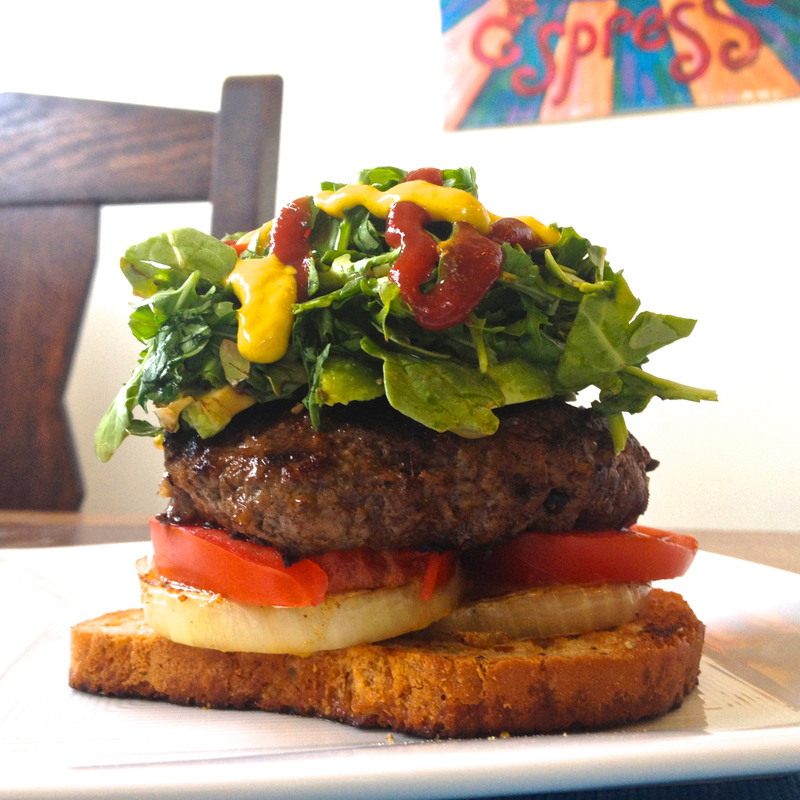 This tasty burger is award-winning! I was presented with “Jake’s Favorite Burger Award.” What does that mean? It means this is my friend Jake’s favorite burger! Yay! I think it looks like it was made by a man who just mowed his lawn and got curious about what it would taste like if he piled some clippings on his much-earned burger. Luckily this particular man has a lawn made entirely of organic arugula and he massaged the clippings in apple cider vinegar and the burger tastes great! A few fun facts: There is a top piece of bread, it’s just hiding on the other side of the plate. This is organic, grass-fed beef. The burger is gluten-free, soy-free, corn-free & dairy-free. It has about 6.5 grams of sugar (4g from two slices of bread, 2g from the ketchup, and a whole medium tomato has 3.2g of sugar, so I’m guessing these two slices are around .5g). Everything in it is organic except for the bread. Also, I eat beef if it’s organic and when I feel like I need it, which varies greatly. It seems like once a month or every two months, I’ll eat a one pound package of grass-fed organic beef or a bag of beef jerky. But it’s not often. Beef is an inflammatory food and I can tell I swell from it a bit. I also usually keep my meat separate from carbs because my body stays leaner that way. It’s called food combining and it’s very effective. The theory behind it is that the enzymes that break down carbs and proteins are different and mixing them makes digestion more difficult. Without going into a huge explanation of how and why I eat what I eat, I’ll simply say everyone is different, but I wanted to share that I eat this meal as a rare, well-done treat! Toast Bread Heat a separate large pan for about thirty seconds. Add olive oil and set the bread slices in the oil, covering each side. Toast each side in pan until brown. Sauté Onion Add onion to the same pan so it can sauté in the oil at the same time. I like to use the least amount of pans possible so there is less clean up afterwards. Spice & Cook Burger When the first side looks cooked almost half way up to the raw side, flip the burger and add oregano to the cooked side. Add pepper to one side when it is almost done. I don’t know that much about cooking burgers, but it seems like when I don’t drain the fat out of the burger (or smash it with a spatula or puncture it to see how well it has cooked), the juices help cook the burger all the way through in a more even way and in a shorter amount of time. It seems like the boiling juice inside is helping cook the center. Once it is cooked all the way through, there is less fat to drain anyway. So my advice is don’t smash, puncture or drain it until it is done cooking. How will you know it’s done cooking without puncturing it? I don’t know yet. I wait until I think it’s done and then puncture it in the center a little bit with a small knife. If it has juice immediately come out, I quickly stop applying pressure and leave it be. If it seems cooked, it’s done. Massage Arugula In a small dish, massage the arugula with the apple cider vinegar about 10 times. Don’t be scared to squish it. Cool the Bread Once the bread is toasted to your liking, lean it at an angle on the edge of your plate. This sounds weird. But the bottom of the gluten-free bread makes condensation from the heat and moisture so if you place it flat on the plate and leave it in the same place, it can get soggy. I like to air it out by leaning it at a diagonal on the lip of the plate. Once it’s cooled down for a couple of minutes while I do something else, I’ll flip it over and move it to a different section of the plate. If there is condensation under the original spot, I’ll wipe off the water. Slice Tomato & Avocado Cut two tomato slices. Open your avocado by running a knife through the center until it hits the pit, then sliding the knife along the pit to slice the avocado in half. Pull the halves apart and slice the side without the seed. Scoop out the slices with a spoon. I used about 1/4 of an avocado.